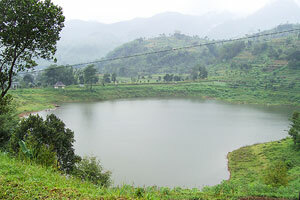 kilometers before Sarangan Lake, from magetan, is another natural lake, named Telaga Wahyu (Wahyu Lake). It is 15 hectares in size, with a climate not much different from Sarangan Lake, and definitely easily accessed by big or small vehicles. At Wahyu Lake, tourists can relax while fishing. At certain times there area also various arts and camping performances are held. Near the lake, tourists can find a natural water spring named ‘Sumber Tamtu’. It is said that the water from this spring has the virtue to make people stay young. Sarangan and surroundings are good for hiking: beautiful scenery, friendly people and a cool climate.